While social networks are paving the way to their supremacy in the digital communication, many companies jump on their bandwagon by adopting Enterprise Social Network (ESN) technologies. Today, the success of a project hinges on a number of factors including the involvement of all team members, their ability to react timely and cooperate with others. 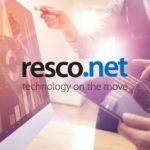 By adopting ESN technologies such as Microsoft Yammer, Salesforce Chatter, IBM Connections, Jive, and many other alternatives, companies aim to lay out a relationship management platform that will boost their employees’ engagement as well as greatly transform and optimize the internal communication. So, why do enterprises integrate ESN platforms with such core business systems like CRM? Use a notification channel to decrease CRM downtime due to the prompt technical support and maintenance. Share achievements of the company (e.g. signed contracts, new opportunities added to CRM system), current goals, events, motivational content to make positive buzz and improve employees’ retention and engagement. Create a collaborative environment for over 4,000 employees and geographically dispersed teams with a shared CRM system. Improve visibility of sales processes, deals, and current activities. Why We Used a Homegrown Application to Integrate CRM with Workplace? The customer preferred CRM integration with Workplace to other alternatives because it combined the same general Facebook features familiar for people of different age – news feed, groups, video streaming, audio and video calling, chat messaging, etc. Thus, the adoption phase would be smoother compared to other applications. Moreover, there would be no additional training needed. The only difficulty our team faced at the beginning was integration of a beta version of Workplace Graph API with the current customer’s CRM. The API wasn’t ready to meet the market of larger competitors, so we had to provide our customer with the additional API enhancements. Needless to say that in 2016, when we were about to connect 4,000 of active users to still immature Facebook’s ESN platform, custom integrations were not available. Hence, we were among the first teams who tested the system, fixed bugs and adapted it to our customer’s needs and numerous workflows. 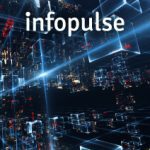 For this reason, Infopulse team used Integration Hub, a homegrown application created in collaboration with EVRY. 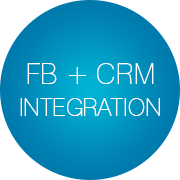 It allows integrating different systems, such as MS Dynamics CRM, MS SharePoint, MS SQL, Workplace by Facebook, etc. Built on asynchronous logic, this standalone application, was initially developed to enable CRM and SharePoint integration. After its successful implementation, the app was subsequently used to bridge the customer’s key business systems on-premise or in the cloud (e.g., CRM & Workplace by Facebook, CRM/SharePoint & SQL, SharePoint & Reporting Services, SharePoint & Human Resources module). Integration Hub solution was born during the migration project from Dynamics CRM 2011 to Dynamics CRM 2016. Our team had to improve out-of-the-box CRM and SharePoint integration to ensure data security and advanced data management; eliminate server code and direct actions between systems. Primarily, managing security of a large number of sites, lists and list items in SharePoint took extra time and manual operations to provide secure access to voluminous and confidential data of a huge enterprise. With the Integration Hub implementation, such processes were automated. Besides, the SharePoint folder hierarchy was replaced by sites. Thus, every time a new opportunity, product or service is added to CRM, a separate site is created. This change affected data management and strengthened security of each separate site. 15 workflows for instance site creation. Forms for providing interactions with the end users. The following Integration Hub architecture can help you understand how all these components enable integration with an ecosystem of the customer’s business systems. By means of this application, the team managed to implement a myriad of integration scenarios for the customer along with Workplace and CRM integration. Prior to the official release of Workplace custom integration services (Graph API + Account Management API), our team had to deal with an early nature of a product. APIs missed some functionality and their capacity was insufficient to enable full integration with the customer’s CRM. To build reliable notification and communication channels for the employees of multiple departments, especially sales force and marketers, our team laid out Integration Hub data adapter for Workplace and configurable forms, which connect to a CRM system allowing to request and use data from different systems, record data in the system, and run necessary workflow. Sending automatic notifications on critical system failures, breakdowns, updates, and other system-related notifications. For this, two additional corporate groups were created serving as 24/7 notification channels for all employees. What Benefits Did the Customer Get? Additional notification channel improved the company’s CRM system maintenance and technical support. Now, business end users get timely updates about the system performance and thus, can effectively plan and manage their workflow. Due to this integration, the communication of sales teams was streamlined and optimized. The integrated platform enables better cohesion of geographically dispersed teams regarding opportunity wins, signed contracts, and other sales activities. Enhanced cross-functional teams’ awareness, engagement, and involvement in the company’s strategic goals. Support of Managed Metadata Terms. Compared to the standard integration scenario, this adapter brings smoother connectivity model, securing data and rights management. Integrating Adobe Sign Rest API, we implemented an electronic signing of sales contracts with further upload of all documents to the archive in SharePoint. For this scenario, the Integration Hub adapter additionally utilizes Forms Engine framework for dynamic and intuitive forms creation (including fields validation, authentication and business rules support, writing data in different systems, CSS styles and Java scripts configuration, etc.). Thus, connecting to Adobe Sign, the adapter provides a quick access to electronic signature workflow, automatically checking and saving all updates related to the signing process in CRM/SharePoint. Updating CRM data with the added Human Resources Data. Refreshing CRM data with data from other sales management tools. Saving reports in SSRS in a document library in SharePoint. All this simplified data sharing and management, workflows automation, as well as improved user experience. 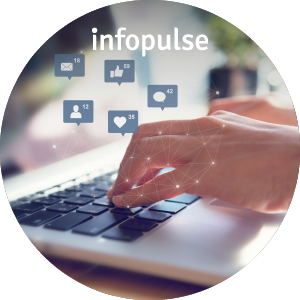 During the migration project, Infopulse managed to integrate Workplace by Facebook with the customer’s integral CRM system shared by many geographically dispersed teams. Challenged by the missing functionality of Workplace beta version, this custom integration became possible due to the homegrown Integration Hub adapter. Consequently, we implemented two effective Workplace integration scenarios that improved the company’s CRM system maintenance and technical support as well as optimized the communication of sales teams in different corners of the world. Contact us today to make use of our custom application integration solutions.